It’s time for a relatively modern romance film from back in the day. Naturally romance isn’t exactly my favorite genre, but at least it also deals with small businesses vs corporate control which is more up my alley. It’s not a bad movie but as with most in this genre it does start out better than how it concludes. If the friend zone card had been played then that may have worked out a little more. The film starts off by showing us Kathleen’s life. It’s rather plain at the moment and she needs someone to vent to. That’s when she reveals that she has been talking to someone online using a chat room in secret. This has been pretty good for her well being and the guy in the computer enjoys their talks as well. It’s all anonymous so nobody has to be any the wiser and even the two people in the chat don’t know who each other is. That’s when Kathleen’s life is turned upside down as a new book store shows up to run her out of business. They believe in the Wal Mart strategy of starting prices low to put all of the local shops out of business before raising prices again. The leader of this company is named Joe Fox and he is determined to destroy Kathleen. Well, he does say that this isn’t personal but who would actually believe that? What Kathleen doesn’t know is that Joe is the person she speaks to on the phone. He didn’t know it either for a little while, but finds out before long. He has to try and keep this secret from her, but can he do it? It’ll be tough but Joe didn’t become a rich CEO for nothing, he’s still got a chance here! The whole point of the dynamic is that both characters don’t know that they are actually confiding in each other. That should have stayed the focus for most of the film instead of Joe finding out and then tricking Kathleen for the rest of the film. I think the movie would have been a lot more fun if this had been the case. It is interesting to see Joe playing so many different roles of course, but it can also be a little dicey. Also, we can’t just forget the fact that of course corporate wins because they always do in these kinds of scenarios. Kathleen was put out of a job so it’s hard to see her get so friendly with Joe right afterwards. At first he plays the friend card so they just hang out platonically but that never seems to last in these things. They may as well be honest with each other and just say that staying friends was never in the game plan for them. The actual romance just doesn’t work at all. Fortunately the writing isn’t half bad though. For the most part the humor lands and the characters aren’t that annoying. I think Kathleen had the best supporting cast. Her reporter friend Frank was good for a while since he is so paranoid about everything and always trying to take shots at technology. The only tricky part here is how quick he was to try and leave Kathleen for another reporter. That’s where you end up losing all respect for the guy. Kathleen’s co-workers were also pretty fun and they did their best to be useful. Even when Kathleen’s mystery man seemed to be a crook they were very supportive. Meanwhile Joe just had 2 characters on his side. The first was his friend who would walk him to the diner when Joe was feeling scared. He seemed like a reasonable guy, but didn’t get to appear much. Then we have Joe’s friend/maybe wife so seemed like a reasonable character until the very end where she suddenly wasn’t. That was the film’s forced way of leaving both Joe and Kathleen open but it was basically plot convenience there. As for the two leads themselves, they weren’t bad. Joe is certainly ruthless in taking down the small businesses, but I guess that is his job so like the guy said, it just wasn’t personal. Of course you shouldn’t just leave your ethics at the door either so it’s complicated. Kathleen was also a reasonable character and put up a valiant effort in trying to stop Joe’s company. It’s just a shame that she couldn’t claim victory here. 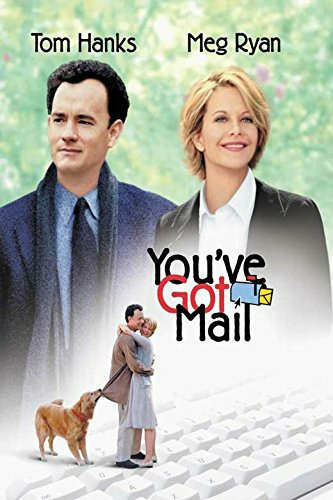 Overall, You’ve Got Mail was a pretty fun film that was mainly held back by the unnecessary romance. Really, just take away the romance and you’ve got a better film. It could have easily ended when Joe put her out of business. If you want a happy ending then just have her get rehired by them. I think that would have made for a more wholesome film and would have given the characters more dignity as well. You still just can’t fall for the person who put you out of business. That’s just too much to buy into. If you want a decent rom-com to watch then this is your ticket. It’s a good bet to watch this one since typically the genre can be a little dicey. This entry was posted in Live Action Movie Reviews, Live Action Movies, Reviews and tagged Comedy, Drama, Film Review, Meg Ryan, Movie Review, Review, Romance, Tom Hanks by dreager1. Bookmark the permalink. The movie has held up quite well since when it first hit the big screen! Nice review. I think Meg Ryan is a revelation in You’ve Got Mail and each and every time I watch it I discover some new aspect of the character. Kathleen Kelly is erudite, down to earth and has a wicked sense of humour. A lethal combination!